to a fevered pitch, culminating in an ad during the biggest game of the year, or not . . . But for today, there is a neat side effect as the tempest in a teapot rages. The Denver Post's Sunday edition has a relatively balanced editorial, "Nothing Wrong With Tebow Ad," written by a self-proclaimed agnostic. "Progressives who are protesting against CBS for deciding to air a Focus on the Family ad during the Super Bowl are likely hurting their cause more than serving it. I'm an agnostic who supports a woman's right to choose and not given to feeling protective of Focus on the Family. But in this case, I think the Christian ministry is being bullied. Why shouldn't the group be allowed to showcase Pam Tebow, the pro-life Christian mother of Heisman Trophy winner Tim Tebow?" I think the bigger story for me is the photo accompanying our local coverage of the national flap - a sweet one of Tim and his Mom, Pam. 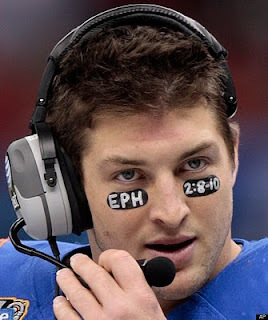 Tim has some scripture in the black football players wear below their eyes in order to deflect glare. When I did a Google search on Ephesians to see what message he was trying to send the world, this week as he stands in the spotlight, I was incredulous to discover the first verse to pop up with Ephesians put in the search window was the verse under his eyes - Ephesians 2:8-10. While the feminist harpies, squeal about whether Pam Tebow's noble choice should be aired during the Super Bowl, they would be wiser to ponder the meaning of the verse this humble young man chose to impact hearts and minds. Not of works, lest any man should boast. For we are his workmanship, created in Christ Jesus unto good works, which God hath before ordained that we should walk in them."